Giggles The Green Bean Turns Stinkytown Into Greentown is the first in a series of children's picture books in which Giggles goes on many adventures. The day Giggles pops his head out of the ground, he realizes something doesn't smell quite right in Greentown. When Giggles grandmother stops by to visit, she explains to Giggles, that Greentown wasn't always known as Stinkytown. She shows him a picture of what his town used to look like which makes Giggles upset, his town was once beautiful, but now, all he sees is garbage, pollution and utter disregard for the land on which they dwell upon. Taking matters into his own hands, Giggles swears to turn Stinkytown back into its glorious state. Upon his quest, Giggles runs into Wise Old Cabbage who lives in a very beautiful area. When Giggles asks him how he keeps everything so beautiful, Wise Old Cabbage explains to Giggles the five steps it takes to make everything green and healthy again. Armed with the knowledge of the Wise Old Cabbage, Giggles begins to correct the environmental wrongs around him...but will Giggles be in time to change Stinkytown to Greentown again, or will his efforts prove too late? I found this to be a most informative book for very young readers to grasp the concept of recycle, reuse, rethink. The interaction between the colourful characters and the simple explanations given are enjoyable to all who read the pages. Not only are the five steps shared with the children, but examples on how you can help are also given to steer the young folks in the correct direction. I believe all school and public libraries should carry this book, as Giggles is an enjoyable, delightful and informative role model for children young and old. The illustrations are beautifully done and will keep the attention of your youngster with many opportunities to explore the pages looking at all the interesting things to see. 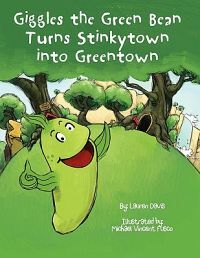 Giggles the Green Bean Turns Stinkytown into Greentown is the first book in the Giggles the Green Bean series. In this fun story the young reader will learn the 5 special secrets Giggles learns in order to turn Stinkytown back into Greentown. Giggles teaches kids important green concepts and skills including recycling, water conservation, healthy eating, and energy conservation using tangible, real-world examples that even the youngest readers will be able to adopt and discuss with family and friends. In keeping with the environmental message, a portion of net proceeds will be donated to the U.S. Forest Service Plant-A-Tree Program.